The Arcam SA20 is their latest Integrated Amplifier which improves upon the performance of the previous Arcam A29. Class G amplification and 80W of power per channel contribute to impeccable sound and efficiency. 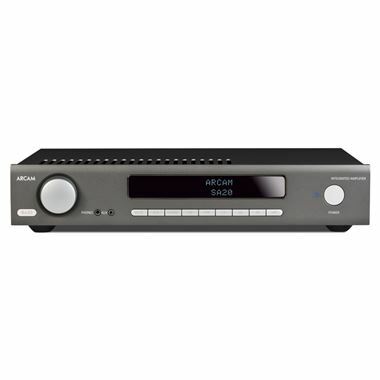 The Arcam SA20 is rated at 80wpc into 8 ohms (both channels driven). It delivers just under 20wpc in pure Class A, while allowing for huge extra power reserves for the most demanding of loudspeakers. There are two frequent problems with hi-fi amplifiers. Class A, the traditional audiophile’s choice, uses a single power supply constantly running at full capacity, even when there’s no signal coming through. Great for reproducing those subtle details at low levels however struggles provide extreme power when needed. Class A/B, the most common amp class, switches between the two internal amplifiers, one for each half of the waveform. Far more efficient but often a recipe for crossover distortion, since those low-level details we crave can get lost within any mis-match between the two switching over. Class G is essentially a hybrid amplifier, utilising Class A specifically for low-level signals, but when required switching in an additional power supply to power those larger sections of the waveform. This groundbreaking amplifier is an absolute must for those seeking true excellence in an amplifier at an incredibly affordable price. As with the SA10 this amplifier has 5x analogue inputs (1x line/MM switchable) but the 3x digital inputs (2x SPDIF and 1x optical) are supplied by the ESS Sabre 9038 reference DAC (as employed in the irDAC2). The SA20 also comes with a brand new learning backlit infra-red handset and can be controlled over IP by ARCAM’s IOS app, Musiclife or by RS232. This amplifier is the direct replacement to the A29.